I am so excited to share this wedding, because there is something so beautiful and sentimental about having a private wedding at home. Private home weddings do not have to be cheesy or uninteresting, either! 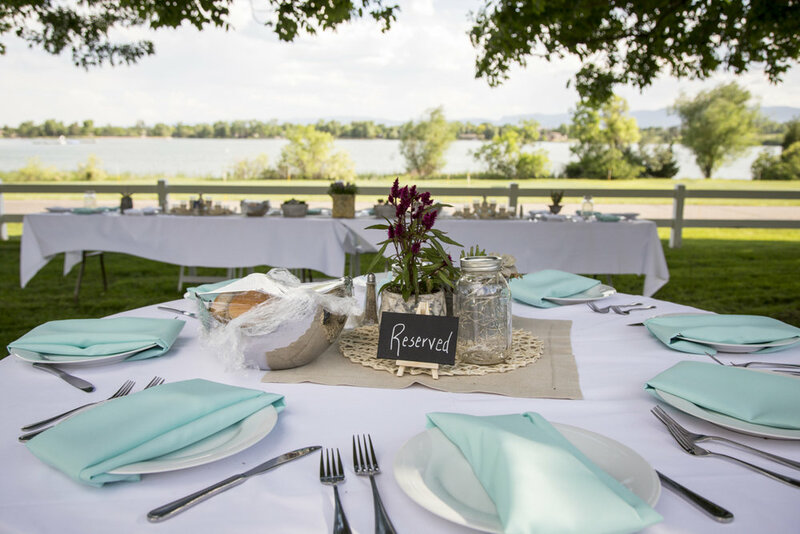 AnnIe & Joe hired me to help plan their beautiful Colorado outdoor wedding and it came together in the best way: full of love, emotion, memories, and beautiful views. Here is a fun story for you! Annie & Joe were neighbors when they were 2 years old. Their parents had actually kept in touch too! AnnIe says that Joe makes her feel like the “most important person in the world”. He proposed to her at the salt flats at sunrise. I can only imagine how romantic, beautiful, and special that was! Joe says that AnnIe is ‘compassionate, creative, and intelligent”. 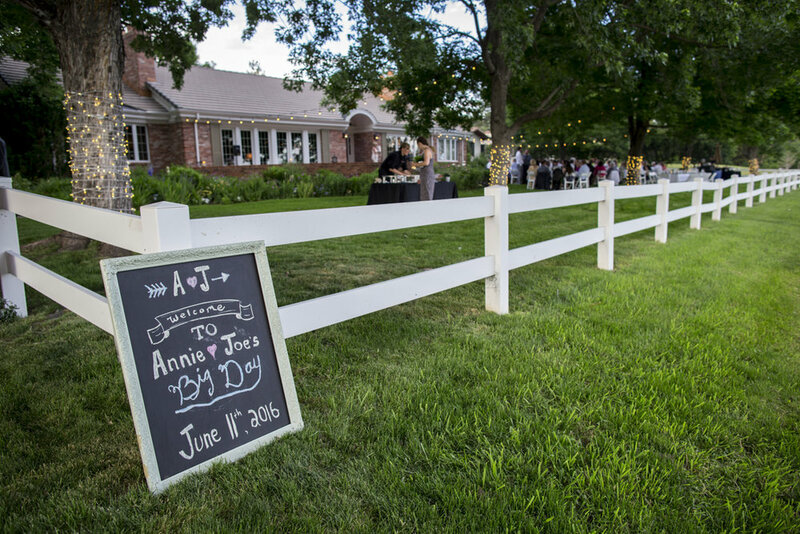 Their individual personalities both played into the overall feel of their wedding day, an outdoor wedding and reception in Annie’s parents home in Bow Mar, CO.
AnnIe’s dad had passed away in 2008, which made it even more special to wed in this beautiful backyard. Her mom and brother walked her down the aisle. It was emotional and a perfect way to honor her strong ties to her family. Their good friend Mike served as the officiant for the ceremony. I always love seeing so many personal touches like this. They make a wedding feel so deep and real! For the unity ceremony, each person in the wedding party carried a single flower and put it in a vase at the "altar." AnnIe and Joe also carried a single flower and place their flower in the vase symbolizing that all friends and family are now joined. It was a lovely sentiment. The wedding party shared a varied and soft romantic color palette of charcoal, grey, and mint. Joe wore a coral tie for a pop of color, which was gorgeous next to Annie’s lace and tulle gown. All of the flowers were all from Annie’s moms garden. Having fresh-cut, home-grown flowers in the centerpieces not only helped the budget and made the decor extra-special, but they were perfect for the outdoor setting of this garden-style backyard. Annie's mom and her aunts designed all of the centerpieces, using light-filled mason jars, potted plants, and votives. There was an absolutely torrential down pour just as catering was serving salads. Remember, this reception was outdoors! Everybody took cover inside of the house and waited it out. As Colorado weather tends to go, we knew it was likely to blow over! When the storm finally passed, there was about 1/4" of water on each salad plate! Nobody seemed to mind the missing salads (we had to throw them out). Annie’s mom pulled out every beach towel that she had and some bath towels and we proceeded to dry everything and everybody off so we could continue on with the reception. Guests filled their plates at the buffet (which we had to move into the garage) and sat whereever they could inside to enjoy their dinner. They were on couches, living room chairs, kitchen chairs and even on the floor and stairs. Eventually things dried up enough to continue reception outside, and the guests danced the night away under the stars! Annie’s dad had always collected port wine. For ‘dessert’, they opened a few special bottles and toasted to him. There wasn’t a dry eye in the house! Annie's Aunt Jill made lots of her delicious, homemade cookies. There were at least 6 dozen cookies in four varieties for guests to enjoy, further adding to the handcrafted and sentimental nature of this backyard wedding. I absolutely loved planning this wedding and working with Annie & Joe to make it the perfect day. Rain didn’t stop us, nothing could have, because the day was driven by love, family, and keeping things beautifully simple. Congratulations Annie & Joe, and thank you so much for trusting me to help you plan this. (Me with Annie & Joe on their wedding day. SO much fun!). Wedding Planning Lingo (with Honest Advice)!